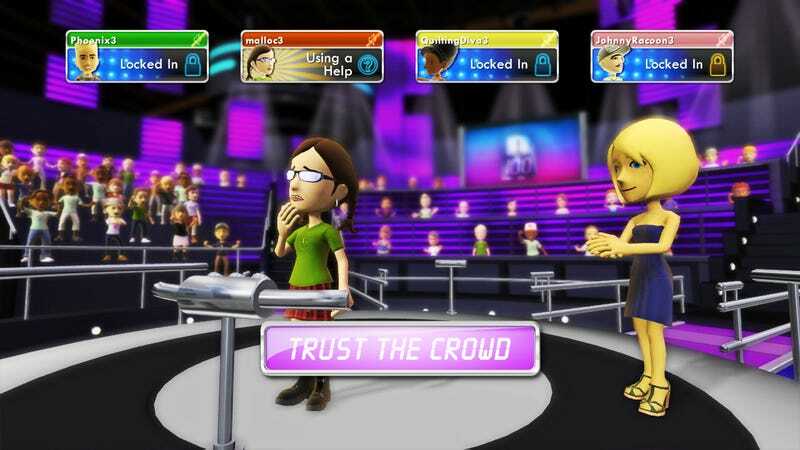 Anyone recall Xbox Live Primetime, Microsoft’s push to do game shows on Xbox Live? No? That’s probably because 1 vs. 100, based on the television show of the same name, was the only one Microsoft ever produced. Xbox Live Primetime was announced by former Xbox executive Robbie Bach at CES 2009, a way for Microsoft to extend the social features of their online service and find a way for players to gather people around a singular experience. In each round of 1 vs. 100, a single person became the chosen The One, while another 100 became the The Mob. Everyone else was relegated to The Crowd. Then, The One is presented with a question with three possible answers. The Mob could answer, as well, and if The One chose correctly, they moved onto the next question. However, only members of The Mob who also got it right were allowed to proceed—the rest were eliminated from the pool. If The One chose incorrectly, the game was over and the winnings were distributed amongst The Mob. However, prior to picking the wrong answer, it was possible for The One to opt-out, keep everything they had so far, and leave. If they kept going, it was possible for them to win up to 10,000 Microsoft Points (worth about $125). Most video game takes on game shows have the real-life hosts record a bunch of dialogue and call it a day, but 1 vs. 100 went the extra mile; there were literally live hosts providing commentary and cracking jokes. It was surreal! So surreal, in fact, that Microsoft didn’t keep 1 vs. 100 around very long, even though people seemed to dig the concept. There were only two “seasons” of 1 vs. 100, and though fans were clamoring for a third, it never happened. 1 vs. 100 was formally canned in July 2010. Robbie Bach, the Microsoft executive who revealed Xbox Live Primetime, left the company a few months before that. According to former Kotaku editor Brian Crecente, the game was a victim of mismanagement. Despite Microsoft proclaiming Xbox Live Primetime to be one of the future pillars of the Xbox 360, the company never really got behind the idea. Season three was apparently killed because the game wasn’t making enough money to cover the costs of paying people to write new trivia and host. In an interview with Polygon, Microsoft claimed it was working on ideas similar to 1 vs. 100 for Xbox One. So far, though, there hasn’t been anything like it.